Thank you for visiting the RS2 Architects website. If you have any questions, comments, or would like for someone to contact you regarding your project, submit the contact form below with your thoughts, call us today or stop by our office anytime to chat about your project. Our door is always open, you can walk right in. We love talking about architecture. 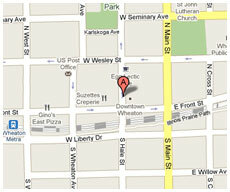 Our office is located in the heart of historical downtown Wheaton. Please click the map below to find us.